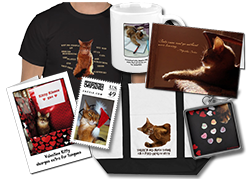 You are here: Home / Shop / Special Items for Special Kittys / Holiday Gifts for Cool Kitties! Holiday Gifts for Cool Kitties! I imagine that most humans will go to their local pet store chain to get their cats gifts this holiday season. But maybe some of you kitties out there already have Da Bird, a Cat Dancer, a fairly decent cat tree and various catnip mice. 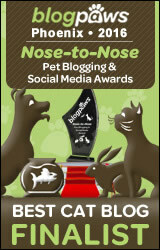 If you want a little something out of the ordinary, point your humans toward this page — maybe it will inspire them! I like this cool bed because it has lots of privacy and we kitties can pretend we’re fierce jungle creatures! It comes in your choice of three different wild animal prints and there are two sizes, for smaller and larger kitties. I bet this bed would make you dream you were running down a gazelle! Since it’s pink, this is clearly a bed for girl kitties! It comes with a microwaveable, herbal insert so it’s warm, like laying near the heater without the risk of burning your fur! Plus it comes with toy kitties attached to it, so you can snuggle up against them, or beat them up if you’re in a feisty mood. Now this looks like a load of fun for both you and your human! It’s a special track with a ball in it. You can enjoy chasing the ball around the track, and your human can enjoy assembling it in several different configurations, so it’s like a new toy all over again! In fact, if your humans got a bunch of these, they could build a track that went all over the house! This is a great gift for kitties who like being earth-friendly! It contains a pair of hemp mousies, catnip, catnip spray and a lightweight cork ball to bat around! All of it in a little vinyl gift bag. This would make a perfect Secret Paws-type gift! Why try to fit yourself on a tiny window ledge or hang out on an ordinary carpeted platform when you can have your very own Window Chaise? This item looks like the height of kitty comfort — it even has 2″ thick orthopedic foam, and the bolsters are comfy faux suede. With this perch, you can watch birds and keep an eye out for intruders in luxury! And always, humans should wrap their kitty gifts in big boxes with lots and lots of wrapping paper — that way, it’s like giving your cat three gifts in one. They can dive into the wrapping paper, hang out in the boxes and have fun with their new presents! My Disclosure: The links to these kitty gifts are what are called “affiliate” links, which means if you click on them and buy anything from the website, I get a small commission! Unfortunately, I did not get any of these things to try out myself, I only wrote about them because I thought they looked cool. If you want to shop somewhere without my affiliate links, I recommend you visit suppliesjust4pets.com — it’s a store run by the human of my friend, Baby Patches! Baby Patches gets to try out a lot of their toys. She is a very lucky kitty! What fun toys…I can’t wait for Santa Paws to come! Thanks for stopping by and saying a little purr and prayer for me! Ooooh! I fing dat da Bergan Turbo Track looks like lots of fun! Great picks! We’d love to have any of those wonderful gifts! P.S. We love Baby Patches store! Ooooh, I want one of those window chaises!